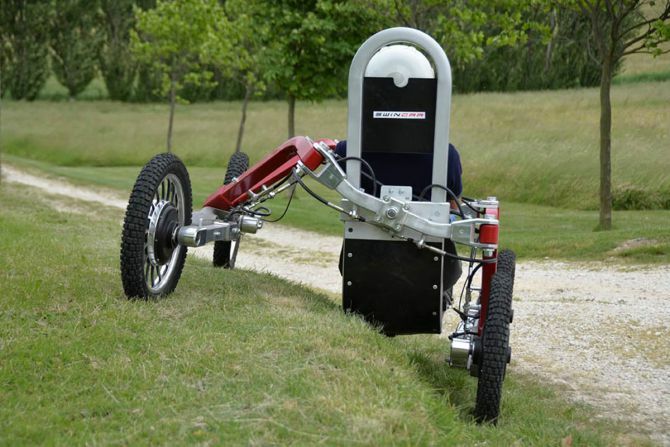 The appropriately named Swincar Spider has an electric motor in the hub of each wheel and all four wheels are independently suspended on long articulated spider-like arms. These enable the Spider to go up and down inclines as steep as 70 degrees, traverse 50-degree slopes, and cross ditches diagonally, all while keeping the driver vertical. And it will also lean into turns at speed, just like a motorbike. 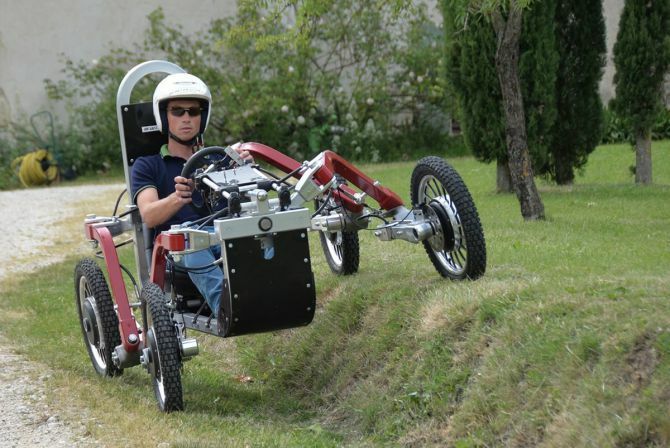 French inventors Pascal Rambaud, Jerome Arsac and Thierry James spent eight years developing their innovative off road scrambler, and launched at the 2015 Geneva Invention Fair where they were rewarded with a cluster of prizes including the public prize and a gold medal with congratulations from the jury. The independent tilting suspension arms provide each wheel with an incredible range movement and enable the Swincar to cross terrain with extreme inclines and rough trenches that would be impossible in any other type of ATV. And then when you arrive on good flat surfaces and build up some speed, the Spider leans in like a stable 4-wheel motorbike. Hydraulically assisted 4-wheel steering and braking make operating the as Spider easy as your courage will allow. Swincar also has a two-seater version in the works for double the fun. For more information, please visit www.swincar.fr.